Movies constantly bombard us with unrealistic expectations of love. Real life, meanwhile, tells us that most relationships are poor, nasty, brutish, and short. But there’s no need to feel depressed about romance. Read on to restore your faith in love. When Irina and Woodford McClellan got married, they never imagined it would be another 11 years until they could be together. In the early 1970s, Irina was living in Moscow working for the Institute of World Economy and International Relations. It was there that she met an American professor named Woodford McClellan. Irina and Woodford fell in love and married two years later in May 1974. Only a short while later, in August, Woodford’s visa expired and he had to leave the Soviet Union and return home. Woodford tried to visit his wife in Moscow but was repeatedly denied entry. In turn, Irina was denied permission to leave the country, without explanation. The two newlyweds marked their anniversaries with cards, photographs, and phone calls. Over 11 years later, Irina finally received the green light to move to the United States. In late January 1986, she flew into the Baltimore-Washington International Airport. Her husband, whom she had last seen a decade ago in an airport thousands of miles away, greeted her with excitement and open arms. Reporters there captured the heartwarming reunion, and Irina further captured the experience in a book—Of Love and Russia: The Eleven-Year Fight for My Husband and Freedom. Anna Kozlov had only been a newlywed for three days when she bid her husband Boris adieu. 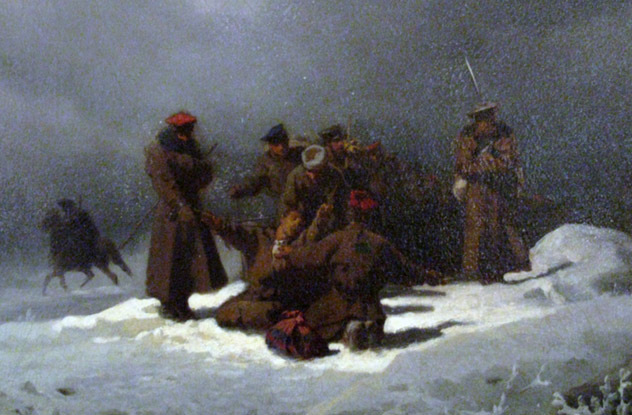 He was off to fight in the Red Army and she would await his return—or so they thought. During Boris’s time away from home, Stalin exiled Anna and her family to Siberia, and Anna couldn’t even leave word for her husband. Boris spent years looking for her. The two shared a hometown, but Anna was barred from visiting it, so the two completely lost contact. Anna was so distraught that she seriously contemplated suicide. Her mother then destroyed all mementos of Boris and Anna’s life together, including wedding photographs and letters. She eventually remarried. Boris, unbeknownst to her, did the same. Years passed, and both lost their spouses. And then, 60 years after Boris and Anna had said “I do,” something miraculous happened. 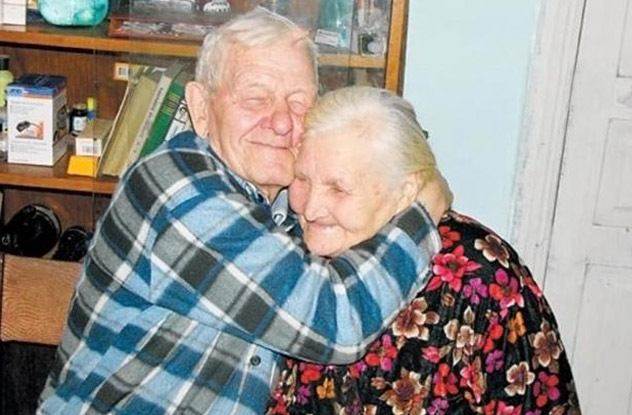 Anna at last managed to visit their shared hometown of Borovlyanka when she saw an elderly man in the distance. It was Boris. He’d come to the village to pay his respects at his parents’ burial site, and when he noticed Anna, he ran up to her. In true fairytale fashion, they had a second wedding and lived happily ever after. The Notebook famously tells of a woman who suffers from dementia and her husband who reads their story to her to remind her of her life. The movie is based on a fictional romance novel, but it didn’t have to be. Jack and Phyllis Potter are the real life British version—in his early 90s, Jack Potter refuses to let the love of his life slip away into the solitude of dementia. Jack started keeping a journal when he was a child, and he kept up the practice his entire life. When Jack met Phyllis on October 4, 1941, the pages of his diary captured their romance. Jack liked Phyllis from the moment he met her, describing in his diary, “Very nice evening. Danced with [a] very nice girl. Hope I meet her again.” A mere 16 months after that first encounter, the two were married. They lived in Kent, England for over half a century. Eventually Phyllis’s dementia took a deep hold on her life and it was too much for Jack to handle on his own. She had to move into a nursing home. That didn’t deter Jack. He visits her every day. And every day, he reads to her from his diaries. He reminds her of their family and pets with photographs. Through everything, Phyllis hasn’t forgotten how much she loves Jack. She’s always overjoyed when he arrives to see her. 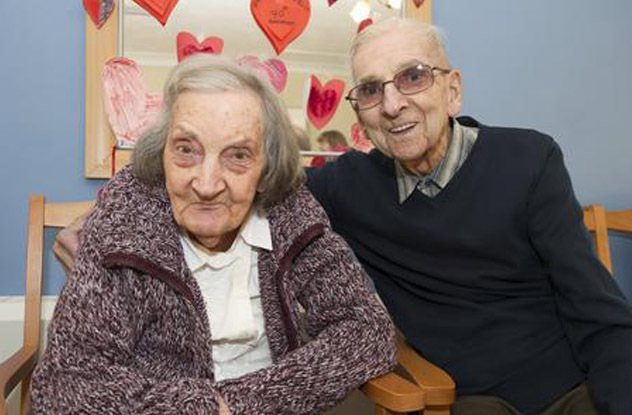 The two have now been married for 70 years. When Carol Harris starred as Sleeping Beauty in a third grade play, her co-star George Raynes “laid a big wet one on her.” George was playing the prince and had just initiated his first kiss. George moved from Saint John, New Brunswick to Toronto, Ontario after high school, where he got married and raised a family. Decades passed, and 61 years later, he lost his wife. He decided to revisit his old stomping grounds in Saint John, and there, Carol and George crossed paths again. The two hit it off and quickly became close friends. 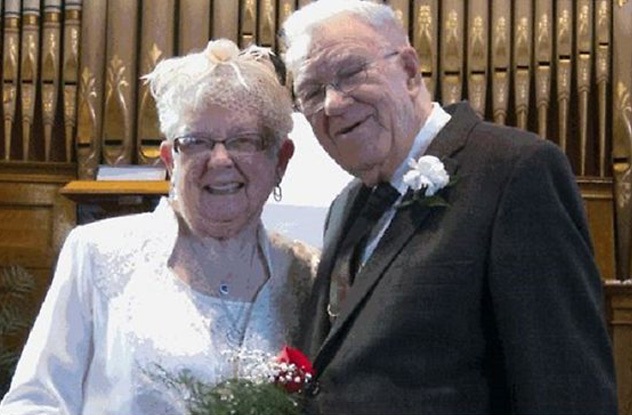 A romance blossomed, and George proposed to Carol in an Ontario restaurant. Rounding out their fairytale first kiss, George told People magazine that their romance was “Like Beauty and the Beast,” and Carol says, “I finally found my Prince Charming.” Amazingly, 75 years after their first kiss, they were married. In 1983, friends set Forrest Lunsway and Rose Pollard up at a party, hoping the two would dance together. Forrest had been widowed twice. Rose had lost her own spouse to a long and painful illness, and she had no intention of remarrying. She just wanted companionship. Even though they lived 64 kilometers (40 mi) apart, they made the effort to see each other regularly. It was a slow courtship. For the next two decades, Forrest would often drive the full distance to take Rose on a date and then drive home afterward that same night. In 2003, Forrest moved in with Rose in Capistrano Beach. Then he proposed. Rose didn’t take him seriously, since he was 90 and she was 80. She jokingly agreed to marry him when he turned 100. For Forrest it was no joke, and as his hundredth birthday approached, she decided to take him up on his offer. The couple were married at their local Community Center on Forrest’s 100th birthday. A beautiful nearby hotel donated a free honeymoon ocean-view room. Congratulations came from all over the world. Even President Barack Obama and First Lady Michelle Obama sent well wishes. Ann was 17, born to Syrian immigrants. John was 21, and the two grew up in the same neighborhood. The two became friends in high school when he would pick her up and take her to their Connecticut school. Ann’s parents nearly thwarted the blossoming romance—her father had planned to arrange a marriage for her to someone 20 years her senior. Refusing to give up on love, John and Ann ran away to New York City. Ann’s father lamented, but a family member consoled him by saying young love wouldn’t last. The lovebirds eloped in 1932 and watched the world go through incredible transformations, from the Great Depression to World War II, from the golden age of radio to TV to iPhones. 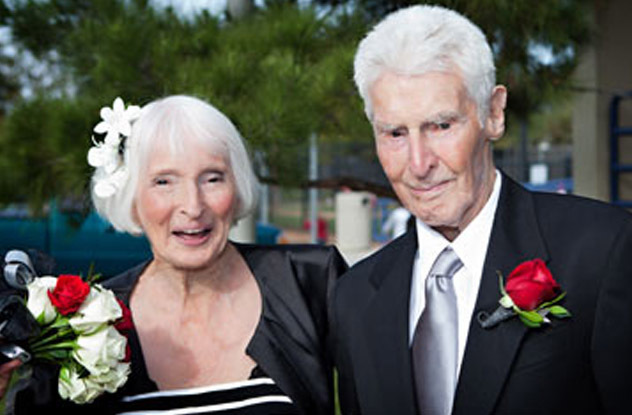 On November 24, 2013, John and Ann Betar celebrated their 81st wedding anniversary. The couple have created quite the brood. Their five children birthed them 14 grandchildren who had 16 great-grandchildren. John, 102, and Ann, 98, are the longest married couple in the United States of America. Sometimes, the most touching love stories are those that carry on after one person dies. Fred Stobaugh has never gotten over losing the love of his life. He married Lorraine, the “prettiest girl [he] ever saw” in Peoria, Illinois in 1940, and their romance was always happy and wonderful. They had three kids and four grandchildren. After 73 years of marriage, Lorraine passed away. Fred, now 96, lived on and tried to mend his broken heart. A month after his wife’s death, he came across an ad for a local song-writing contest. By his own admission, Fred was tone deaf and a non-musician, but he wrote one of the most beautiful and heart wrenching songs to hit the airwaves. He lacked the musical skills to record “Sweet Lorraine,” but he sent in the lyrics along with a letter. Green Shoe Studio was so moved that they decided to make his song come to life. Then they made a short documentary titled A Letter From Fred to show the world Fred’s story. When John Mace first saw Richard Dorr, his “heart went pitter pat.” They met in the 1950s as students at Julliard where their shared love for music turned into love for each other. John had been married before, so Richard helped raise John’s son Paul. When Paul died in 1983 in a car accident, they helped each other through the grieving. For many years, they had to hide the truth of their affections from the world. For decades, the couple stayed together despite country-wide homophobia, and in 2011, the couple rejoiced when New York legalized gay marriage. The couple celebrated by showing family, friends, and reporters their relationship by spending the weekend performing love songs in their apartment. Sixty-one years after their paths first crossed, John Mace, 84, and Richard Dorr, 91, wed in a quiet ceremony in June 2011. Les Brown Jr. and his wife Helen were both born on December 31, 1918. When they met in high school, they were instantly smitten. Les came from money, while Helen’s family was working class, so their parents disapproved of their young love. But as soon as they left high school at 18, the pair eloped. They lived their life in Southern California, where they raised a family. They spent every day together and even in their 90s were an active and healthy couple. Near the end of their days, Helen was sick from stomach cancer and Les was suffering with Parkinson’s disease. 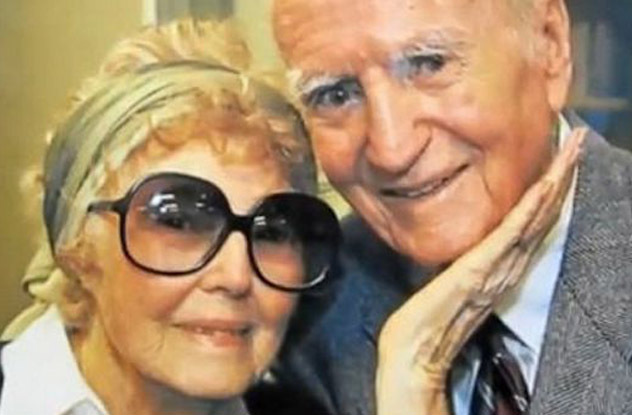 After 75 years of marriage, Helen died on July 16, 2013. Les passed on the next day. After knowing her grandfather as a somber and dignified man, Judith Lovell was in awe when she discovered love letters between him and her grandmother. David Hurd had moved from Jamaica to New York City in 1907 where he took on all sorts of jobs to earn his keep. Feeling lonely, he started writing to a woman in the Caribbean. His first letter reached Avril Cato in October 1913. Over the next year David fell head over heels for the mystery woman without ever even seeing a photograph of her. Their romance grew with each letter, sent with dabs of perfume along with the loving words. Even though they’d never met in person, David sent a letter proposing marriage and nervously awaited a response. Avril’s family gave their blessing. 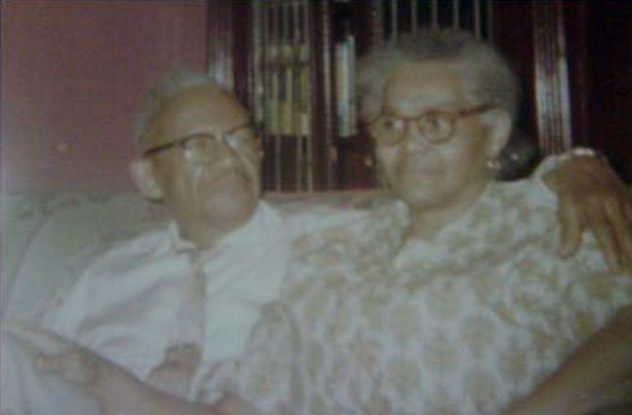 The first time they met was in Jamaica when David arrived for their wedding date in August 1914. Sparks flew just as both had hoped. Avril left for America with David the day after their wedding. They settled into New York City and raised six children. Avril passed away in 1962. David would never marry again and loved Avril until the day he died in 1971. Kristance grew up in a haunted house in Vermont. When she isn’t compulsively traveling the globe, she’s looking up weird facts and making awkward YouTube videos. An avid culture geek, she’s a trained anthropologist and archaeologist. Follow her on Twitter or read about her adventures at diggingtoroam.com.